From Mother Nature Network. 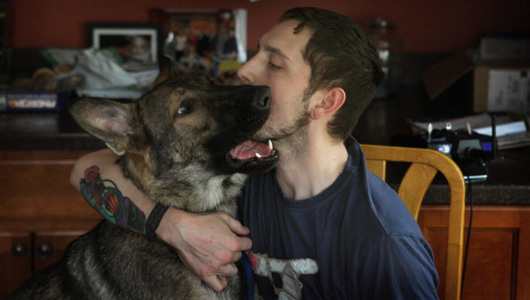 Pictured is Army veteran Brad Schwarz with his service dog, Panzer. It’s International Assistance Dog Week, a time to recognize the dogs that help humans with their disabilities and limitations — but not all service dogs are guide dogs or canines trained to assist with physical disabilities. Many dogs provide support to veterans suffering from post-traumatic stress disorder or PTSD, but although more veterans are being diagnosed with the anxiety disorder, a new Army policy has made it more difficult for soldiers to obtain service dogs. There’s plenty of anecdotal evidence that service dogs help veterans cope with PTSD, but research lags and even some service-dog experts remain skeptical. There have been no double-blind, randomized controlled trials on the benefits of service dog and PTSD patients, and there are no widely accepted standards for training dogs to alleviate PTSD symptoms. Researchers at the James A. Haley Veterans Hospital in Tampa, Fla., are conducting the first study that looks at benefits of pairing veterans with PTSD with specially trained dogs. Congress recommended the three-year study, permitting the Department of Veterans Affairs to match as many as 200 veterans with dogs, but only 17 participants are currently enrolled. Three service dog organizations partnered with the hospital to conduct the study, but Guardian Angels Medical Service Dogs (GAMSD) is the only association still involved in the research. The organization trains PTSD service dogs to perform such tasks as awakening clients from nightmares and reminding them to take medication. Carol Borden, GAMSD’s executive director, says she’s seen dramatic improvements in veterans’ lives after they’ve been matched with dogs. "The results are very immediate. They’re very quick. It’s not a cure, but they are able to manage their challenges much better than they have in years,” Borden told NBC News. Demand for PTSD service dogs is high, according to Borden, who says that most recipients spend four years on her organization’s waiting list. It’s estimated that 13 to 20 percent of the more than 2.6 million Americans who served in Iraq or Afghanistan since 2001 have or could develop PTSD. But unlike service dogs for people with more obvious physical disabilities, there’s a gray area regarding who can have a dog accompany them into certain places. The American Disabilities Act requires businesses to allow people with disabilities to enter with service animals, but PTSD-trained dogs are often considered therapy dogs under the ADA. Dogs whose sole function is to provide comfort or emotional support do not qualify as service animals under the ADA. Service dogs assist disabled people with specific tasks like opening doors and pulling wheelchairs. Therapy dogs, on the other hand, provide comfort, motivation and emotional support. With proper documentation they can often be taken onto planes and other spaces where animals aren’t usually allowed. Although PTSD service dogs are trained to respond to certain cues, such as nudging an owner into a petting session if he exhibits panic attack symptoms, some people are skeptical about the idea that a dog can assist with a so-called invisible disability. However, there’s evidence that interacting with animals produces biochemical changes in some people’s brains. Research shows that when people focus on petting a dog, it can increase oxytocin, a chemical that quiets the brain’s fear response. Caring for a pet also helps people become more secure and self-sufficient, according to Hal Herzog, a psychology professor at Western Carolina University. Training service dogs can also be a form of therapy, according to Rick Yount, founder of Warrior Canine Connection, an organization that has PTSD patients train service dogs. After completing a 2008 training program at a veteran’s hospital, many participants reported lower stress levels, decreased depression, better impulse control and improved sleep. Yount says that it might be most effective for veterans with PTSD to train a service dog before receiving one themselves. "They have to convince the dog the world is a safe place, rather than letting the dog prove to them that the world is a safe place,” he told MSNBC.